Toronto, ON, February 1, 2010 – Toyota Canada Inc., (TCI) today announced it will begin fixing accelerator pedals in recalled Toyota Division vehicles by the end of this week. 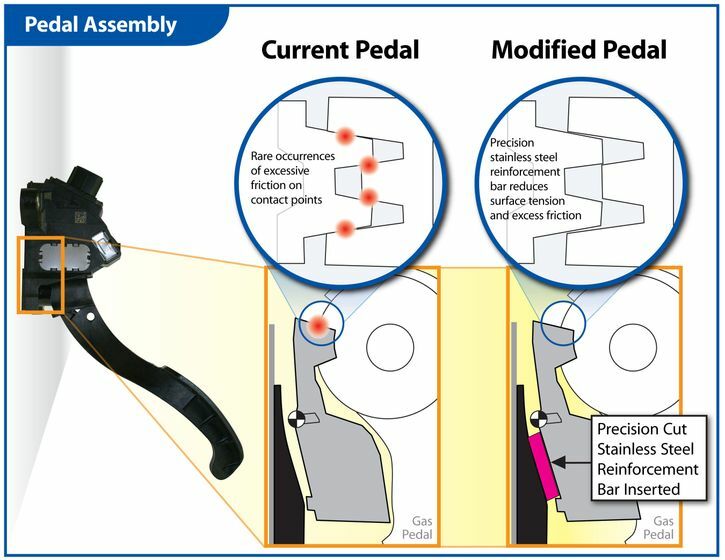 Toyota’s engineers have developed a solution that involves modifying the pedal assembly to eliminate the excess friction that has caused the pedals to stick in rare instances. Toyota Canada announced, on January 21, it was recalling approximately 270,000 Toyota vehicles equipped with a specific accelerator pedal assembly and suspending delivery of the eight models involved in the recall on January 26. The company also announced that Toyota would stop production of the affected models on North American production lines for the week of February 1 allowing the company to focus on fixing vehicles for customers whose models are involved in the recall. Should a driver experience a sticking accelerator pedal while driving, the vehicle can be controlled with firm and steady application of the brakes. The brakes should not be pumped repeatedly because it could deplete vacuum assist, requiring stronger brake pedal pressure. The vehicle should be driven to the nearest safe location, the engine shut off and a Toyota dealer contacted for assistance. Although the accelerator pedal action may return to normal, NO further attempt to drive the vehicle should be made. Information and answers to questions about issues related to this recall are available to customers at www.toyota.ca and at the Toyota Customer Interaction Centre at 1-888-TOYOTA-8. Toyota has pinpointed the issue that could, on rare occasions, cause accelerator pedals in recalled vehicles to stick in a partially open position. The issue involves a friction device or lever, in conjunction with a spring in the accelerator pedal assembly, that is designed to help control the force necessary to depress the pedal and the return force necessary to release the pedal to allow for smooth operation of the accelerator pedal. Due to the materials used, wear and environmental conditions, surfaces may, over time, begin to stick and release instead of operating smoothly. In rare instances, the friction of the accelerator pedal may increase to a point where the accelerator pedal may become harder to depress, slower to return or, in the worst case, become stuck in a partially depressed position. Toyota’s solution for current owners is simple, effective and quick to deploy. A precision-cut steel reinforcement bar will be installed into the assembly that will reduce the surface tension between the friction shoe and the adjoining surface. With this reinforcement in place, the excess friction that can cause the pedal to stick is eliminated. The company has confirmed the effectiveness of the newly modified pedals that had previously shown a tendency to stick.